In a beautiful medieval hamlet at the border between Chianti and Valdambra, this medieval castle offers 1,038 sqm of surface to be used for a boutique hotel, a museum or simply as a private residence. The building, architectonically and historically very interesting, hasn’t been used for a long time thus needing several renovations to be carried out. As of today, ceilings and screeb have been remade. 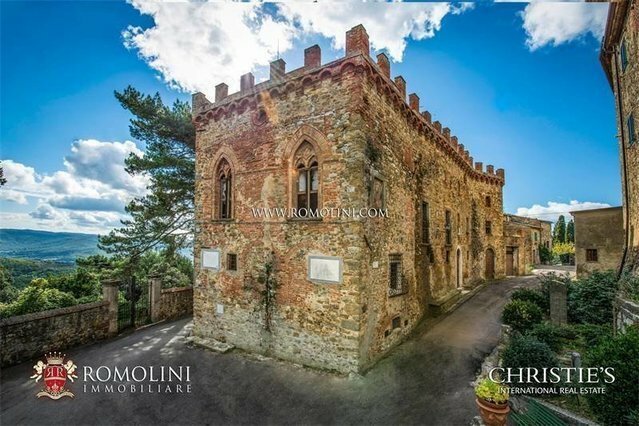 GEOGRAPHIC POSITION In panoramic position at the border of a beautiful medieval hamlet in the Tuscan countryside, medieval castle to be restored. Easily reached via the municipal road network and in a dominating location on the slope of a hill, the castle offers a unique and unrivaled view over the surrounding countryside and allows visiting the most renowned towns of Tuscany in a short time frame: Bucine (18km; 25’), Arezzo (43km; 50’), the medieval city of Siena (33km; 40’), Montepulciano with its Nobile wine (53km; 50’), the papal Pienza (59km; 55’), Cortona (62km; 50’), Montalcino (64km; 1h 5’), the Renaissant Florence (75km; 1h 15’), the turreted San Gimignano (79km; 1h 15’), the Etruscan Volterra (84km; 1h 25’) and the beautiful sea of Follonica (140km; 1h 40’). The most convenient airports to reach the property are Firenze Peretola (92km; 1h 15’), Perugia Sant’Egidio (106km; 1h 15’), Pisa Galilei (153km; 1h 55’), Bologna Marconi (174km; 2h 20’), Roma Ciampino (234km; 2h 35’) and Roma Fiumicino (249km; 2h 30’). CURRENT STATE AND FINISHES The original core of the castle (613 sqm – 6,596 sqft) dates back to the 16th century, but the building we can see today is the result of many enlargements and modifications which took place over the centuries. The ground floor is made up of small service rooms (modified at the beginning of the 20th century to accommodate a farm). Right at the center of this floor there are the two staircases leading to the first floor: the first one linear (with vaulted ceiling) and a secondary well. From the entrance hall one can go both right and left, into two sections (not linked between them). Here there are the kitchen (with fireplace) and a small bathroom. The first floor (piano nobile) has a better planned layout, revolving around a central corridor. The north-eastern section hosts the reception hall (as large as the building) decorated with luxury finishes (ceiling coffers and moulded bracket). Another room opens from the south-eastern side with a balcony. Here we could find in the past a decorated fireplace with pietra serena elements and a multicolored hexagonal-tile floor. On the south-western side, the first floor opens on a crenellated terrace. Finally, another staircase well reaches the terrace on the rooftop. A careful analysis of the castle, together with the apparently chaotic distribution of the rooms, shows how the building is the result of multiple enlargements and modifications which took place over the centuries. There is no way to understand which alterations took place between the 16th century (Capitani di Parte Guelfa, Popoli e Strade from 1584) and the Catasto Leopoldino since the maps from the Capitani are pretty simple and doesn’t give accurate data about the building itself. Modifications in the last two centuries surely contributed to the enlargement of the building, which was much smaller in the Catasto Leopoldino (1834) than it is nowadays. Interventions in Neogothic style took place after this year and not before 1877. The tower, a cliché of medieval buildings, is a later addition (before 1902 based on a photo of that year already showing the tower in its place) and is not connected with the interior, thus having a merely decorative purpose. Between the 19th and 20th century in Italy a new mentality rose with the idea of a continuation of styles which wanted to break with the Classicism in favor a medieval style. This medieval revival interested both single monuments (like the Mackenzie Castle in Genova and the Rocca di Crespi d’Adda built between 1893 and 1905) and entire hamlets (like the Borgo Medievale del Valentino in Torino). These buildings are the result of a rediscovery of popular values against the sketchiness of Neoclassicism, with structures recreating an idealized Middle Age which never really existed. Often (but not always), this works didn’t involve artists and schools and that’s why structures are not touched at a deep level and works involved only the realization of a cover (like a shell) around the building. Façades are made out of sandstone and masonry without an apparent logical distribution. It is clear how different materials have been used through the years to cover subsequent enlargements of the buildings following the criteria of what materials were easier to find in the area. Pinewood fixtures, where still present, are in good conditions. The terrace on the rooftop is covered in a tar coat protecting the building from water infiltrations and preventing mould formations. The lack of care during the use as a farm caused heavy degradation on the inside, where water infiltration (now resolved) caused the detachment of plastering and the loss of wall decorations (where present). As of today, the building is in builder’s finish: ceilings have been recovered with a system of wooden beams and the screeb for the floorings is completed. Walls and systems (electricity, water, gas…) need to be installed. Not far from the castle is located a building (75 sqm – 807 sqft) for which a project has been approved to enlarge (up to 140 sqm in total) and convert it into a nice villa. Right in front of the entrance one can find a 20 sqm apron which could easily host two vehicles. THE DEMOLISHED WING: RECONSTRUCTION PROJECT Next to the castle was located a three-story wing, demolished in the 1970s. The structure was exploited during World War II by German snipers (Scharfschützen), thanks to the small openings allowing the shooter to stay hidden and out of reach of Allied return fire. The project involves the rebuilding of an independent townhouse (350 sqm – 3,766 sqft), still on three floors but split into eight independent apartments: - Apartment N°1 (57 sqm – 613 sqft): living room, kitchen, double bedroom, closet and two bathrooms; - Apartment N°2 (44 sqm – 473 sqft): living room, bedroom, kitchen and bathroom; - Apartment N°3 (37 sqm – 398 sqft): living room, kitchenette, double bedroom and bathroom; - Apartment N°4 (45 sqm – 484 sqft): living room, kitchenette, double bedroom and bathroom; - Apartment N°5 (38 sqm – 409 sqft): living room, kitchen, bedroom and bathroom; - Apartment N°6 (37 sqm – 398 sqft): dining room with kitchenette, double bedroom and bathroom; - Apartment N°7 (39 sqm – 420 sqft): dining room with kitchenette, double bedroom and bathroom; - Apartment N°8 (39 sqm – 420 sqft): dining room with kitchenette, double bedroom and bathroom. USE AND POTENTIAL USES: A RECOVERY PROJECT The castle, given its incredible historic and architectural value, can be used in multiple ways. The location in a beautiful medieval hamlet in a central area of Tuscany allows quickly and easily moving throughout the whole region to visit its most renowned and appreciated towns and cities. A proposal for the recovery of the building has been forwarded and aims to connect the building with the surrounding territory: the environmental and cultural interests of the many hamlets of the area are a valuable attraction. The idea is to make the castle a reference point for cultural, economic and environmental initiatives. Given the past use of the building as a farm, the sale of products from local entities would allow restoring a connection with the economy of the area. The basement (where two more rooms will be opened up, they are visible through holes in the walls) will host an info-point with a small shop. In one of the recovered rooms (equipped with an independent access) one could set up a bike-renting business to be used in conjunction with the numerous tracks and paths present in the outskirts of the town. The ground floor could accommodate a sort of hostel, with a kitchen and a dining room in the 16th century lodge. Bedrooms will be located along the south-eastern wall, taking down several walls built throughout the centuries after the original building (thus not historically relevant). Once completed, these rooms could host up to 30 persons. Right at the center of the floor, there will be a corridor and the reception area of the hostel. The remaining space, architectonically less relevant, will be used for an infirmary and a fire-preventing service. The first floor, with its decorated and nicely-embellished rooms, will host a library with a multimedia center, while the adjacent room will be a didactical entity with temporary and permanent exhibits. The hall with access to the terrace will become a food- court (or even a bar) which could be used by the guests and visitors of the building. A bathroom will be built next to the staircase. Finally, the terrace on the rooftop will be recovered to be used as a panoramic point of view over the beautiful surrounding landscape. The tower, currently unused and with a solely decorative purpose (there is not even an access), will be made usable with the demolition of a wall at the base of the turret.